Research expenditures at the University of Michigan increased by 10.8 percent in fiscal year 2001-02, bringing the total to nearly $656 million. "Michigan's success in attracting research investment benefits the University, the community and the state of Michigan," said President Mary Sue Coleman. "Our outstanding research performance attracts faculty of the highest quality and provides our students with a rich learning environment. Our prominence as the nation’s leading research university supports the state’s economic infrastructure and serves as a powerful magnet to new ventures." The percentage increase, the largest in more than 10 years, resulted from growth in nearly all major areas of research. It was led by a 17 percent boost in funding from the Department of Health and Human Services (HHS), which includes the National Institutes of Health (NIH). HHS accounts for nearly half of the sponsored program funding at U-M and is the primary fuel for the expansion of life sciences research. In all, federal funding rose 12.4 percent and non-federal support, excluding U-M contributions, increased by 9.2 percent. This marks the 20th consecutive year of research increases at the University. 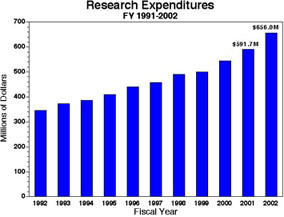 In the last five years, research expenditures have increased by 43.1 percent, from $458,478,301 to $655,981,080. "Michigan’s success is the outgrowth of our institutional fabric," said Fawwaz Ulaby, vice president for research. "This unprecedented increase is a tribute to the faculty’s creativity in generating exciting ideas and novel solutions to research problems, to the graduate students, post-docs and other members of the research community who carry out so much of the daily work involved in the research projects, and to the administrative staff throughout the university who provide the support infrastructure that makes all the research possible." Research funding represents support from a combination of sponsors, including all areas of government, private foundations and corporations. In addition, the University allocates substantial funding of its own for research, a total of more than $100 million in FY 02, a 6 percent increase. University support for research seeds new research projects, promotes novel and hard to fund areas of scholarship and helps build the advanced infrastructure that sustains leading-edge research. In a time of constrained state resources, the growth in research funds is highly beneficial to University students. In commenting on research funding, Marvin G. Parnes, associate vice president for research and executive director of research administration, was quick to point out the broad impact. "Research support is essential not only to maintaining the growth in research activity, but, combined with other resources, to supporting state-of-the-art facilities for undergraduate and graduate student learning, and financing a large portion of our graduate students’ tuition and living expenses." Ulaby will make a complete report to the Regents and the University community on the status of research at U-M at a fall Regents meeting.